When we talk about the social safety net in Canada, what do we mean? What are the policies and systems in place to help people in poverty who have to leave work and seniors? 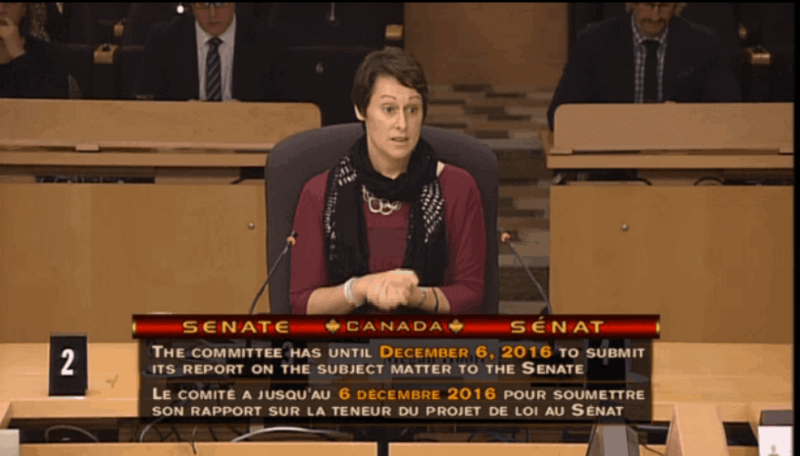 Last week, CWP’s Deputy Director, Megan Hooft appeared at the Standing Senate Committee on Social Affairs, Science and Technology to discuss changes to employment insurance and old age security, and what they mean for Canada’s international human rights obligations. You can read through her presentation below or watch the video recording here. Good evening honourable members of the Senate. Thank you for the opportunity to present to you today on the important issues of employment insurance, old age security and poverty in Canada. My name is Megan Hooft, and I am the Deputy Director of CWP. I will focus my comments today on the proposed provisions in the Budget Implementation Act, No 2. that will affect single seniors living in poverty, the working poor in Canada and relate to the larger context of the development and implementation of a Canadian Poverty Reduction Strategy. Canada Without Poverty is a federally incorporated, charitable organization dedicated to the elimination of poverty in Canada. Since our inception in 1971 as the National Anti-Poverty Organization (NAPO), we have been governed by people with direct, lived experience of poverty, whether in childhood or as adults. This lived experience of poverty informs all aspects of our work. CWP is encouraged by the government’s actions to amend the Old Age Security Act to increase access to benefits for seniors who face an increased cost of living because they must live apart from their partners. As Canada’s senior population grows, concerns about retirement are persistent – according to the group CARP, in 2011, 36% of people surveyed in Canada expressed a lack of confidence in their ability to save for retirement in 2011. As this Committee has likely heard from other witnesses, despite the fact that seniors have made some important gains in their after-tax incomes, 600,000 people over the age of 65 remain in poverty in Canada. Senior women in particular disproportionately experience poverty, with elderly women making up 73% of all poor seniors in Canada living alone. The UN is concerned. In a recent review of Canada by various international human rights treaty bodies it was noted that elderly women’s access to adequate social assistance benefits as well as adequate housing was a serious problem that requires the governments attention. It is unconscionable to think that in a country as wealthy as Canada a senior adult may be on the verge of eviction or even homelessness, or unable to pay for necessary medications because they simply couldn’t afford it. Seniors living in poverty rely on Old Age Security (OAS) and the Guaranteed Income Supplement to ensure they have an adequate standard of living. This includes food, housing and clothing among other needs. It is about their basic needs, it is about their rights. The proposed changes to OAS represent an important signal that this government is willing to take steps forwards to meet Canada’s larger human rights obligations for people living in poverty. We are also encouraged by the changes to employment insurance eligibility as proposed in Part 4 of the Act. As many members of this committee are likely aware, employment sadly does not guarantee that individuals are free of poverty, homelessness and hunger. In fact, 70% of people living in poverty are considered working poor. This not only means they are struggling to make ends meet while employed, but they are facing considerable challenges if they find themselves without a job. Another harsh reality with regards to employment insurance is that not all individuals can access benefits under the program. Estimates suggest that only 38% of unemployed individuals can access benefits. In some regions it has been even worse, with eligibility in Toronto at one point hitting 26%. This does not bode well for a country where job precarity is increasing. As stated in the Canadian Centre for Policy Alternatives Alternative Federal Budget, employment insurance is not keeping up with the realities of the job market as 20% of jobs are part time and approximately 14% are contract or seasonal. Most jobs being created in Canada are low-paying, part-time, temporary or contract and without long term benefits. Barely half of those working today are in permanent, full-time positions that provide benefits and a degree of employment security. Precarious employment in particular has increased by nearly 50% in the last 20 years. In Maritime Provinces, the lack of stable, full-time employment is notably visible. On Prince Edward Island, only 45% of workers have full-time jobs. It is important to think of these realities when considering programmatic and policy initiatives that could alleviate or increase economic stability for those without work. Employment, poverty and an adequate standard of living are human rights issues. Canada has international human rights obligations it must uphold, including allocating the maximum of available resources to ensure rights are fulfilled. The proposed changes represent important steps towards the fulfillment of Canada’s international human rights obligations, and also respect the rights and needs of individuals. However, a gap remains between individual policies and a holistic, rights-based strategy for poverty. Too many people are struggling in poverty, living in inadequate conditions or are on the verge of financial collapse due to a job loss. We need a stronger social safety than the one that we have. Without a holistic anti-poverty plan, these policies will not address some the root causes of senior poverty or employment precarity. In summary, in deliberations of this Act, we commend the changes proposed to EI and OAS, however, we suggest that this Committee recommend that Canada consider these issues under a broader rights-based anti-poverty strategy that targets the systemic causes as opposed to individual piecemeal policy. Thank you for your time. I look forward to answering your questions in this regard. Gertrude Schaffner Goldberg, “Poor Women in Rich Countries: the Feminization of Poverty”, (2009), Available here: https://books.google.ca/books?id=ky_iBwAAQBAJ&pg=PT164&lpg=PT164&dq=Elderly+women+make+up+73%25+of+all+poor+seniors+in+Canada+who+are+living+alone.&source=bl&ots=mP6BMH1k14&sig=-. Wc__2QYiurSItnmleMtbokCQhM&hl=en&sa=X&ved=0ahUKEwi_sL-Q-qnKAhUMFj4KHcb5Dq4Q6AEIIjAB#v=onepage&q&f=false. United Way Toronto, “It’s More Than Poverty: Employment Precarity and Household Well-Being: Summary”, February 2013, available here: http://www.unitedwaytyr.com/document.doc?id=90. MacKillop Centre for Social Justice and Poverty Bites, “WE CAN’T LINGER”, available here: https://eradicatepovertypei.files.wordpress.com/2013/04/poverty_eradication_strategy_for_prince_edward_island.pdf.